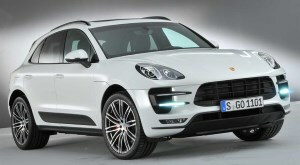 Difference between revisions of "Porsche Macan"
'''Porsche Macan (''Typ'' 95B). 2014 to date (prod. 100,000 sold by June 2015). 5-door SUV. F/A, 1984 cm³ (I4 DOHC), 2967 cm³ diesel, 2995, 2997, 3604 cm³ petrol (V6 DOHC).''' Smaller SUV (compared with [[Porsche Cayenne (92A)|Cayenne]]) sharing platform components with [[Audi Q5]]. Very wide stance, more Porsche sport car-like looks. Plenty of luxury features, decent power from the V6s, quick transmission, and excellent handling for the segment, albeit with some understeer. Refresh shown December 2018, with larger touchscreen in centre and digital screen replacing analogue instruments; diesel deleted. New V6 announced as part of revisions. '''Porsche Macan (''Typ'' 95B). 2014 to date (prod. 100,000 sold by June 2015). 5-door SUV. F/A, 1984 cm³ (I4 DOHC), 2967 cm³ diesel, 2995, 2997, 3604 cm³ petrol (V6 DOHC).''' Smaller SUV (compared with [[Porsche Cayenne (92A)|Cayenne]]) sharing platform components with [[Audi Q5 (8R)]]. Very wide stance, more Porsche sport car-like looks. Plenty of luxury features, decent power from the V6s, quick transmission, and excellent handling for the segment, albeit with some understeer. Refresh shown December 2018, with larger touchscreen in centre and digital screen replacing analogue instruments; diesel deleted. New V6 announced as part of revisions. Porsche Macan (Typ 95B). 2014 to date (prod. 100,000 sold by June 2015). 5-door SUV. F/A, 1984 cm³ (I4 DOHC), 2967 cm³ diesel, 2995, 2997, 3604 cm³ petrol (V6 DOHC). Smaller SUV (compared with Cayenne) sharing platform components with Audi Q5 (8R). Very wide stance, more Porsche sport car-like looks. Plenty of luxury features, decent power from the V6s, quick transmission, and excellent handling for the segment, albeit with some understeer. Refresh shown December 2018, with larger touchscreen in centre and digital screen replacing analogue instruments; diesel deleted. New V6 announced as part of revisions.